Improving quality of life for U.S. veterans is the goal of Circle of Change, a program that teaches vets how to handle traumatized dogs. Jon McGinty visits some dog training sessions and learns how man and his best friend help each other to heal. Things aren’t always what they seem. What looks like ordinary dog obedience classes at two local kennels are really part of an extraordinary program of healing and recovery for military veterans. The Circle of Change project pairs vets who have lingering emotional issues with dogs who have similar problems. By learning how to teach dogs to trust and overcome their anxieties, veterans often learn to do likewise. Matjasco, a retired U.S. Navy captain, and wife Karen, program director, helped develop the project about five years ago, while volunteering at the VA mental health clinic in Rockford. He estimates that about 80 to 100 veterans have participated in the 13-week sessions so far. 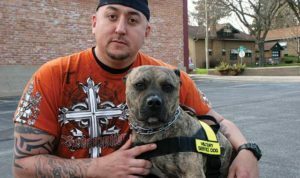 What they did find was a dog trainer who was interested in helping veterans, and from that the program began to develop. Currently the classes take place in two locations: Dave’s Doggie Den, 107 St. Louis Ave. in Rockford, an evening class, and B & B Canine Co. at 8682 Picken Road in Caledonia, a daytime class. Each group consists of six to eight veterans, one or two trainers, and a few vet mentors – veterans who’ve completed the program and volunteer to help other vets in subsequent classes. The trainers provide the venue and the dogs, which belong to clients who’ve complained about behavior problems that make their pets difficult to handle. Participants may also bring their own dogs if desired, and many do. “The issues these dogs have often parallel the issues that vets are facing – issues such as anxiety, avoidance, noise and touch sensitivity, fearfulness or aggression,” Matjasco explains. The veterans enter the program through referrals from VA clinics in Madison or Rockford (a community-based outreach of the Madison clinic). Most are residents of those communities. They typically suffer the effects of an anxiety disorder such as post-traumatic stress disorder (PTSD), or a traumatic brain injury (TBI). Most participants are veterans of the Vietnam War, some served in Iraq or Afghanistan, a few in Korea or World War II. “I’m not a therapist, I’m a dog trainer,” says Vicki Buchholz, co-owner of B & B Canine Co. “But we want the vets to know they have a safe place here. We put all the chairs against the outside walls. We make sure they know they’re welcome to walk around during classes, have a smoke outside anytime. We give them information about how to recognize stress signals in dogs. Dogs have feelings, just like people, and lots of damage has been done to some of them in the past. While the focus is on the dogs, during training sessions, the interaction among veterans is an integral part of the experience for participants. Ralph Timbush, Jr., served in the Marine Corps during the Cold War era. Timbush and his wife, April, are both volunteer mentors, the only husband and wife duo in the Circle of Change program. April was in the Air Force for more than 12 years, including deployments in the Middle East. While serving in Jordan, she and two other women were captured by terrorists and held for five days until rescued. Ralph’s dog, a Blue Healer named Speckles, came to him from a family who couldn’t tolerate her high energy level. Christopher “Tank” Marron is a Marine veteran of the war in Iraq, where he served four combat tours. During his last deployment, he was thrown from a vehicle when it hit a roadside bomb, and suffered a traumatic brain injury (TBI) as a result. His dog, Diesel, a pit bull, is also a veteran of that war, and was used to detect explosives. Tank and Diesel have been together for five years. Marron appreciates the camaraderie which participation in Circle of Change provides. Jim McPherson, a Vietnam era veteran, doesn’t own a dog yet, but plans to someday soon. His children are grown and he lives alone. Trainer Dave Schnidt, owner of Dave’s Doggie Den, has taught McPherson and others about different types of dogs and their personalities, as well as how to go about training and working with them. 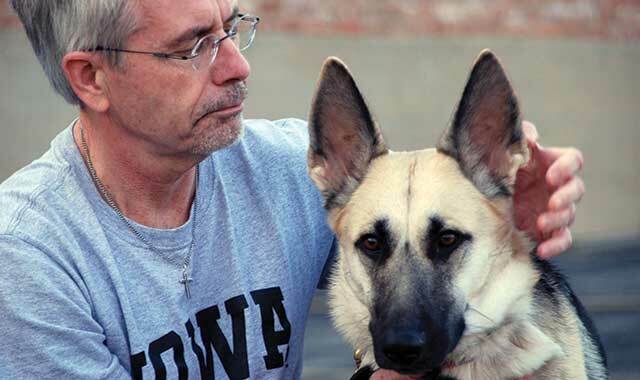 Schnidt is a former on-street dog trainer for the Chicago Transit Authority police. Schnidt’s father was a tail-gunner in a B-17 during World War II, and was shot down twice. Circle of Change is a non-profit organization which provides these classes free of charge to qualified veterans. It’s run by volunteers, including the Matjascos, and only the trainers are paid. The organization solicits donations from social service and veterans organizations and individuals. For more information, or to make a donation, go to its website at www.circle-of-change.org. This entry was posted on Monday, July 1st, 2013 at 11:54 am	and is filed under Features, Top Posts. You can follow any responses to this entry through the RSS 2.0 feed. Both comments and pings are currently closed. My beloved wife is a veteran who was greatly helped by Circle of Change. I think she was in either the first or second class, with the original trainer, and grew with the program. She was out of work 15 years due to service connected disabilities,including PTSD. She went from only leaving the house to keep her doctor’s appointments (would not even get the mail from the curbside box) to being a mentor and speaker on behalf of C of C.
From seeing the dogs relearn trust and heal, she also relearned trust and healed. As the dogs learned that man and other dogs could be friends, she relearned that other folks could be friends. She is now working again, as a civilian test and development engineer for the US Navy’s aircraft development branch. To do this, we uprooted from a comfortable life in northern Illinois and have made a new start in southern Illinois. I only attended a couple of sessions because C of C was for her. The other vets and dogs were the extra she needed that I could not give her. I served in the USAF Reserve, she was Regular Air Force, but there were still things I did not (do not) understand about her experiences. These other vets did and do), which is all I need to know. Thank you Circle of Change.